Already a classic in the alcohol treatment and counseling communities, here is a life-changing guide for anyone in a therapeutic relationship--whether a professional counselor, a teacher, a parent, or a friend. 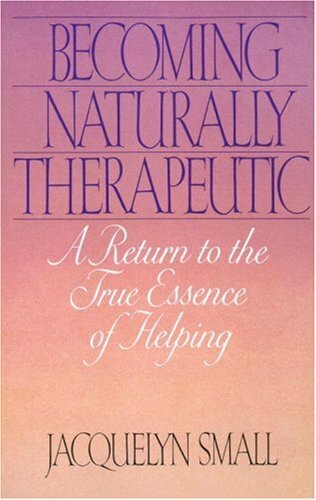 Based on studies that pinpoint the characteristics of the most effective therapists, "Becoming Naturally Therapeutic shows you how to help those you care about by opening your heart and releasing the healer within. A nationally known pioneer in the area of addiction and transpersonal psychology, Jacquelyn Small shows you how to emphasize without enabling, how to care without controlling, and how by helping others in a genuine spirit of giving you invariably help yourself. She teaches how the true art of therapy lives within us all. You'll learn: The ten characteristics--from empathy and warmth to immediacy and concreteness--that all counselors need to discover within themselves. How to overcome patterns of toxic relating--the pitfalls of the preacher, judge, teacher, or savior that are barriers to true intimacy. The principle of helpful confrontation: when to use it and how. How to "straight-talk" beyond codependent ways of helping and point those in need to their own inner strength. Complete with practical exercises and sample dialogues, this clear and compassionate guide will help you let go and become the natural healer you are meant to be.